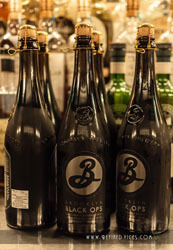 Most of you probably know I'm more of a spirits guy than a beer guy but on the last week of May I went to a whisky bar to photograph a boilermaker or a beer and whiskey pairing event and got to try some amazing beers from Brooklyn Brewery. I also wrote about it on the frontpage, for the full article go here. I really liked all of the beers they had but what really did it for me was the Black Chocolate Stout and the Black Ops Bourbon Barrel aged Stout. I guess I'm a heavy beer kind of guy, the richer it is the better it is for me. The Black Chocolate Stout was just amazingly rich with chocolate and coffee flavours with the Black Ops being very much the same only slightly more balanced and with some notes from the bourbon barrels. I guess my question is, has anyone else ever tried beer from Brooklyn Brewery and what did you think? If you haven't I can really recommend these beers to all beer lovers and fanatics and even to those who may not drink beer very often like myself.